If you are ready to choose the perfect residential fence for your home, here’s what you should know! What Are You Installing the Fence For? Looking to keep your pets and children safe while they play in the yard? Seeking privacy for your family when you take a dip in the pool or host a backyard barbecue? Wanting to boost your curb appeal in preparation for selling your home? Trying to block out noise from a bustling street? Wanting to define your property line a bit better? Depending on your answer to the above questions, you can determine what type of fence is probably ideal for you. However, the right fence for your purpose is not always the right fence for your property. Nobody wants to install an intimidating and gigantic privacy fence right up against the curb! Keep in mind that your fence can serve more than one purpose. 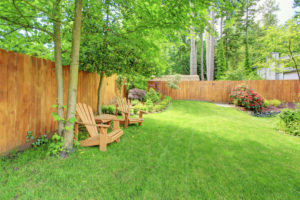 Many homeowners choose to use the portion of their fence in the front yard to boost their curb appeal and raise their home value, while increasing the height in the backyard for a durable privacy fence. Every material has its own positives and limitations, so do your research before signing on. If you want a security fence, never choose a material like chain link that provides an easy foothold. If you want a privacy fence, choose a completely solid and opaque fencing material like vinyl or wood. Only looking to outline your garden, complement your landscaping, and boost your curb appeal? A simple white picket fence will do the trick! This entry was posted on Friday, December 8th, 2017 at 11:10 am. Both comments and pings are currently closed.